California's new (and only) wild gray wolf pups. Photo: California Department of Fish and Wildlife. California’s new (and only) wild gray wolf pups. Photo: California Department of Fish and Wildlife. Big news for wildlife supporters: After an absence of nearly a century, a family of gray wolves—two adults and five pups—has taken up residence in far Northern California’s Siskiyou County. Even better, this is a completely natural phenomenon—these wolves weren’t introduced by any government or wildlife agency. Aside from one lone wolf (dispassionately named OR7 by scientists), who wandered in and out of Oregon starting in 2011, this family are the first wolves to live in California since 1924. They’ve been named the “Shasta Pack” by researchers at California Department of Fish and Wildlife (I’m glad the name has a bit more flair than “OR7”). 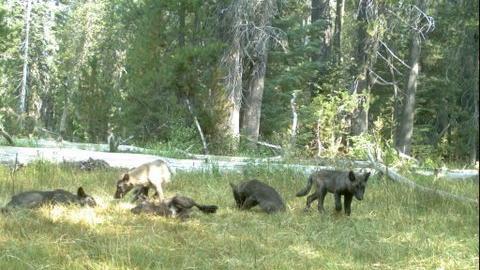 One of the newly discovered Shasta Pack adults. Photo: California Department of Fish and Wildlife. Wolves are reclusive, and the Shasta Pack is quite remote, so their initial presence was discovered thanks only to these photos shot by automatic trail cameras placed by Fish and Wildlife researchers. The specific location of the Shasta Pack is not publicized. But you’re in luck: You can see wolves in Yellowstone. Check out our inspiring guide to the West’s 10 best wildlife viewing experiences.